When you buy a car from auction in Japan with Smile JV, you get professional service and competitive prices! The buying service fee covers all auction buying costs, de-registration and export documentation, taxes, our commission as well as other expenses that we incur. 1. You pay only the winning bid price. This is the actual price (and only price) we charge you for the car! 2. We do not add local consumption taxes to the bid price and hide this as the "cost of the car from auction". Some auto auction agents on Japan do charge you this (without telling you)! Consumption taxes are for local sales only and exports should be exempt. 3. You can see the sold price for the car you bid on and you can search for the price for any used car sold in Japan car auctions! ... it's all about transparency and quality service - this is why Smile JV's customers give us outstanding reviews and keep coming back. If you're are currently buying a large number of units from another car auction agent in Japan at rates you think are favourable, please contact us as we are happy to talk to you about a competitive and immediate pricing structure. 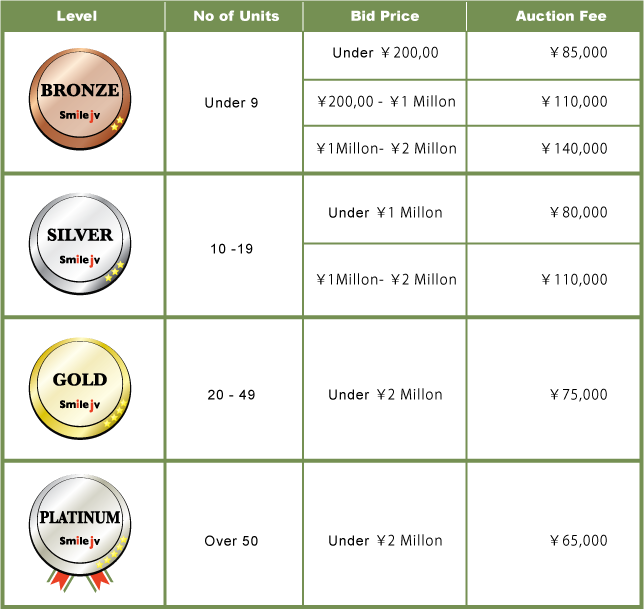 The average Inland transport amount from most auction houses is approximately 10,000 yen. Distant auction houses may incur additional charges which are available for review prior to purchase. Damaged / non running vehicles, trucks, and low down vehicles do incur extra fees so please ask prior to bidding on these cars. Normal marine insurance is 8,500 yen, however extra damage insurance is available by request. Clients who log into Smile JV's auction system can view shipping estimates based on the car selected. Shipping prices fluctuate depending on exchange rates, oil prices, etc., and an actual shipping price is provided when purchasing. See our shipping page for time estimates. Clients are welcome to pay shipping in their own country (and are charged "FOB origin"). In this situation we add JPY 20,000 to the invoice to cover Japan side shipping charges (Port, customs, radiation and freight agent charges). A deposit is required before we perform work for you (translations or vehicle inspections) and before we can accept bids from you. The deposit is not a fee, it simply acts as security to ensure that clients pay for vehicles that they win a bid on and it is subtracted from the final invoice amount. The deposit is refundable for any reason prior to us securing a used vehicle on your behalf, less any bank fees or associated costs. Smile JV Ltd. reserves the right to charge a reasonable fee if work and/or effort has gone into securing a used car, truck or bus on your behalf prior to a refund being requested. To make a deposit please contact us or see the payment options here. Some countries may require inspection before export, for example EAA, Intertek/MOZ, JAAI, or JEVIC. The price for these types of inspections Japan is around $300 (depending on exchange rates) and clients are responsible for these costs. For local sales we are required to charge 8% consumption tax and recyle fees to the invoice. The recycle fee is written on the auction sheet.